The Governors Awards is an annual event celebrating awards conferred by the Academy's Board of Governors – the Irving G. Thalberg Memorial Award, the Jean Hersholt Humanitarian Award and the Honorary Award. Recipients are announced each summer and honored at a dinner gala in November. Highlights from the event are incorporated into the year's Academy Awards show. 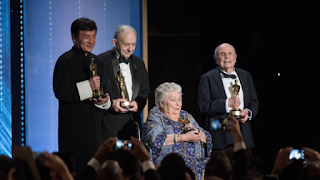 The 2016 honorees are Jackie Chan, Anne V. Coates, Lynn Stalmaster and Frederick Wiseman.